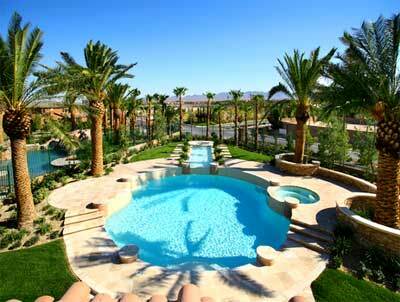 Tuscan Cliffs luxury Las Vegas homes offer home entertainment options. The semi custom luxury home collection, by real estate developer Pacific Southwest Development, has four base floor plans with entertainment built in. The new homes in Southern Highlands knows its buyers are looking for choices in home automation, technology and entertainment. If you would like to have a special room for games, music, wine collections or film the builder can include in the design. Home theater is front and center at Tuscan Cliffs homes in all four designs. An audiophiles dream room includes a large wall sized screen, theater seating in multi levels and surround sound. Taking inventory of your movie and music collection can be daunting and a continual process. An option can include a server based home theater system named Kaleidoscope. A central point for your multi media files can serve your audio and video throughout the home. The convenience of controlling what multi media plays within each room can make entertainment a little more enjoyable. Home automation is what luxury home buyers are expecting. The Crestron system remote controls the audio visual equipment, lighting, air conditioning and heating system. Wouldn’t it be nice to wake up in the morning and have a pot of fresh brewed coffee or create a lighting and music mode with a flick of a switch? The Crestron system can even schedule lights and music according to the time of day or proximity of a resident. The 4,328 to 6,001 square feet new homes offer a wine storage space or wine cellars. Tuscan Cliffs luxury Las Vegas homes offer home entertainment options for buyers.